NEW FOR 2019 - FREE EXHIBITOR PROMOTIONAL TOOLS! IAVs '19 has invested in a NEW system to help you increase your marketing presence. And they are FREE to 2019 sponsors and exhibitors. Spread the word to your network about participating in at IAVs '19 and drive traffic to your website and stand at the event! IAVs hired Feathr (attendance growth specialists) to offer our partners a customised landing page to digitally promote their participation. Text that includes your IAVS personalised Feathr Landing Page link. To send to your network with your Feathr Landing Page link. 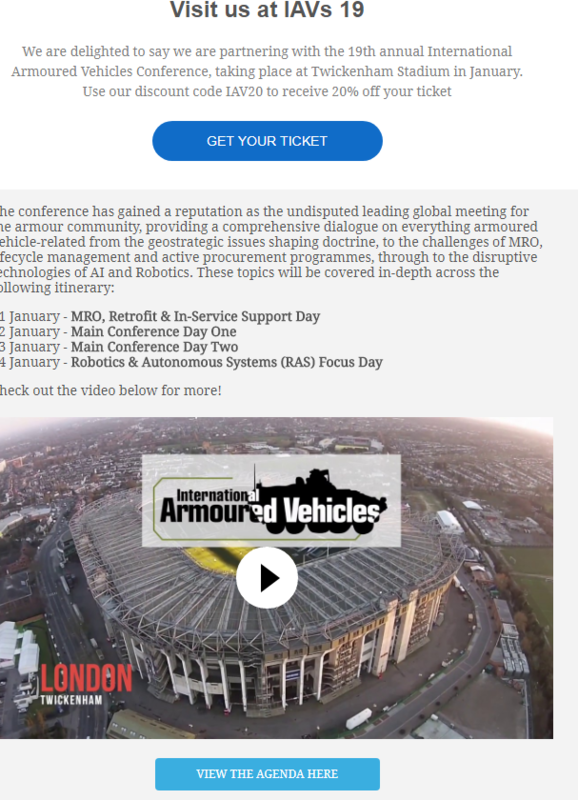 We'll be exhibiting at IAVs '19 in Twickenham Stadium on 21-24 January 2019 and we'd love to see you there! Click here [link words 'click here' to your landing page URL] to learn more and access exclusive savings through our landing page. Feathr provides you an email invitation platform to easily send personalised email to your customers and prospects. We have created a variety of promotional images for Sponsors to download and use in their communications. These are available in your Feathr Dashboard, or email olivia.timmins@iqpc.co.uk for copies.